Remove or empty standing water from children’s outdoor toys, flower pots, old tires, garbage cans, or any object that can hold water. Make sure roof gutters drain properly; clean clogged gutters in the spring and fall. Keep swimming pools chlorinated and their covers free of stagnant water. Change the water in birdbaths every two or three days. Install window and door screens and keep them in good repair. 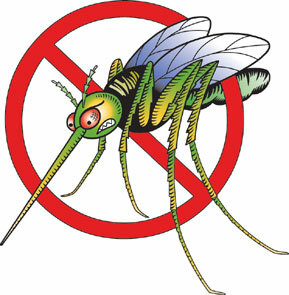 Consider wearing long sleeves, pants, socks and mosquito repellent (according to directions) if outdoors when mosquitoes are active, especially in the late afternoon and evening hours. Decorative ponds and water features should be circulated or chlorinated if they do not contain fish.